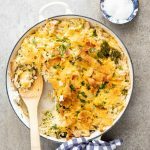 Broccoli chicken casserole is an easy, delicious weeknight dinner and perfect for using up leftovers. The potato chip cheese topping takes it over the top. 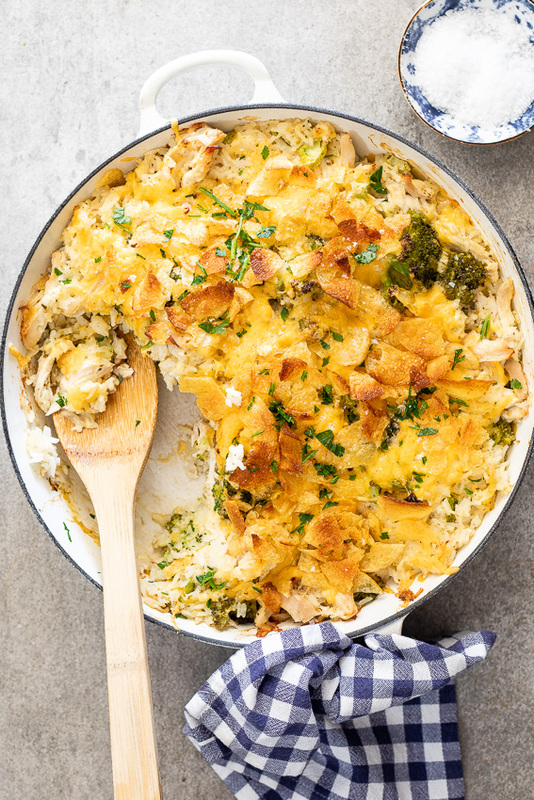 This broccoli chicken casserole recipe is honestly weeknight dinner goals, to the max. Not only is it the perfect dish to use up all the leftovers, it’s so crazy delicious and takes no more than 20 minutes to throw together. I make this casserole whenever I have cooked rice and chicken leftovers (and that happens quite often). 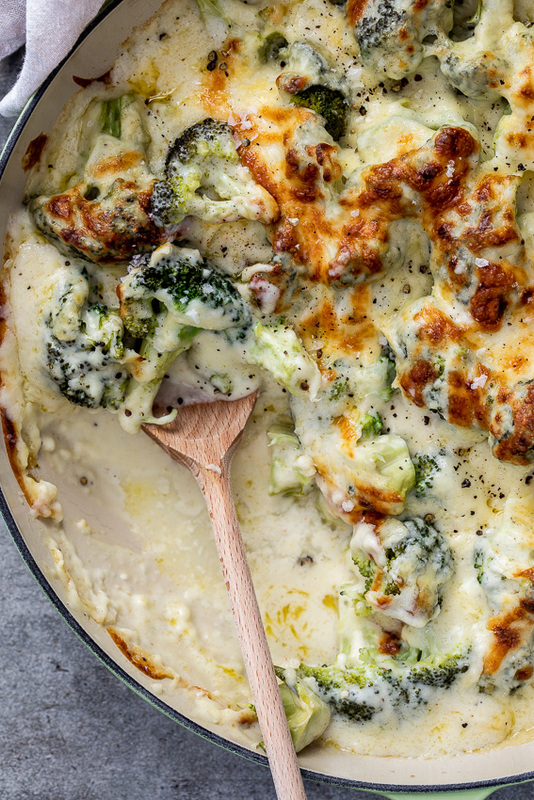 As we are a family of broccoli-lovers, I always have a head or two in the fridge so broccoli becomes an easy addition. 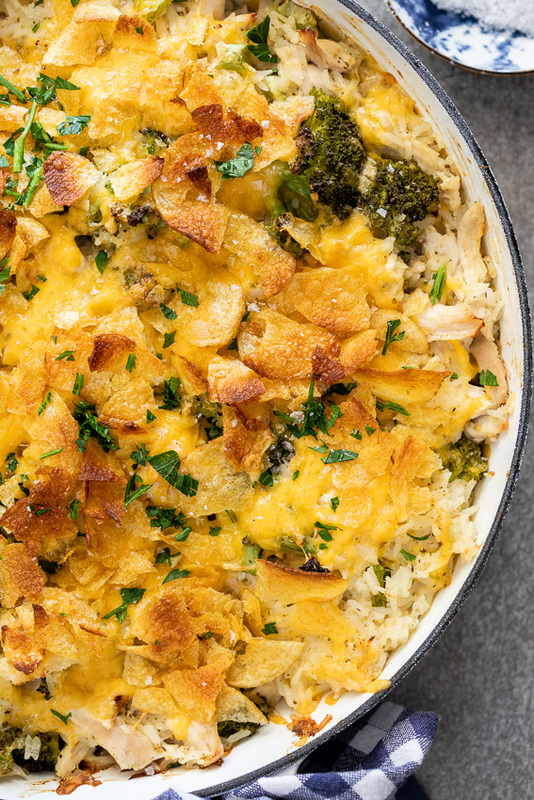 And then I go the old-school route of topping the creamy rice, chicken and broccoli casserole with cheese and potato chips for ALL of the cheesy crunch. It’s not a necessary addition but takes me right back to my mom’s retro casseroles and what’s not to love about that? 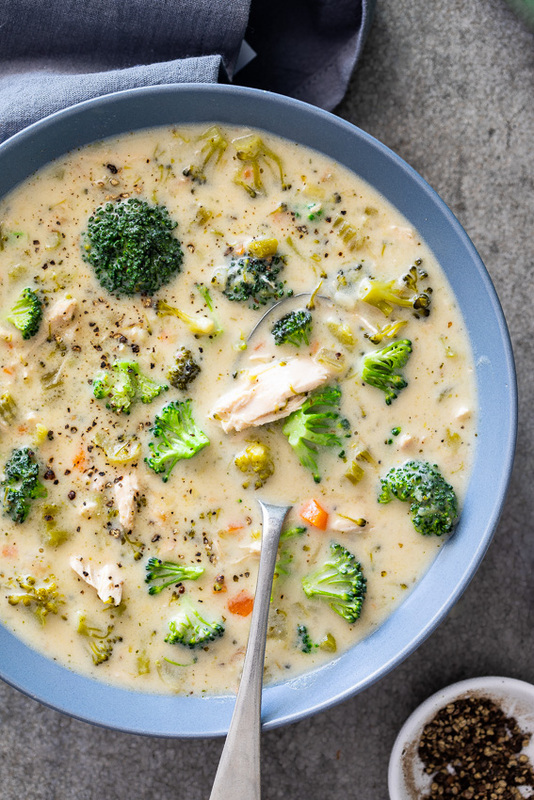 Steam broccoli for 5 minutes then combine with cooked rice and shredded cooked chicken (rotisserie chicken is perfect here). Mix together chicken stock/broth, sour cream and seasoning then mix into the rice and chicken. Transfer to an oven-proof dish and top with grated cheese and crushed potato crisps then bake for 15-20 minutes until the cheese has melted and the top is golden brown and crisp. 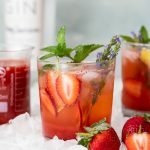 Can I substitute the rice in this recipe? Use cooked brown rice, quinoa or bulgur wheat instead of white rice. Yes, you can freeze the leftovers or the casserole before baking. Make the casserole, but don’t add the cheese and potato chip topping, then freeze in foil baking containers. Press a sheet of baking paper onto the surface then wrap well with plastic wrap. To re-heat, pop the casserole into a pre-heated oven and bake for 20 minutes then top with the cheese and potato chips and bake for another 20 minutes until the casserole is heated through and the potato chips are golden brown on top. Steam or blanche the broccoli for 5 minutes then combine with the rice and chicken. Mix together the sour cream/yogurt, chicken stock and seasoning. Pour into the rice mixture and mix well. Season to taste and transfer to an oven-proof dish. Top with cheese and potato chips and place in the oven. Bake for 15-20 minutes until the cheese has melted and the potato chips are golden brown and crisp. Made this today and it was absolutely delicious. Will definitely make again. This is the type of casserole I just love for those busy weeknights. Ao hearty and delicious. I know my whole family would love this one Alida! It’s perfect for those rushed days when you just don’t have the time or energy for something complicated. Made this for dinner as I had leftover roast chicken from the weekend. Came together in minutes and my family loved it! That’s great to hear Carin! It’s a family fav over here. Ok, so this does NOT take 20 minutes prep – if you read the directions, you need to have the rice already cooked (add that in), then the chicken has to be cooked and shredded (add that in too), and the the broccoli has to already be cut up – so when you add all of that up, this recipe probably takes an hour to prepare. 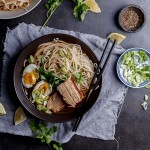 If you’re cooking from scratch it will take around an hour but as I said in the blog post, this is the kind of recipe I make when I have lots of leftovers. You can also use rotisserie chicken and pre-cooked rice (which is readily available in many supermarkets).